In order to determine the cause of failure of a tool, a metallurgist or engineer will ask some very important questions regarding the heat treating procedure of the tool. Temperatures and times at each temperature will be included in these questions. The correct answer to these questions in not "the same as we have always done" or "according to the book". Recordkeeping for tool steel heat treating is a vitally important function in the heat treating process. 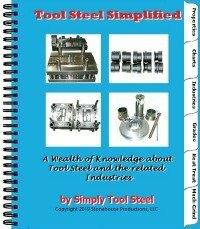 Many tooling failures are caused by improper heat treating. When a tooling failure occurs, the heat treating process is usually the first part of the tooling manufacturing process that an engineer will look. Recordkeeping can be very simple or very complex. The data capturing method is not as important as the data that is captured. Most tool manufacturers have some type of job number or router number that follows the tool throughout the production process. This number should be recorded with the tool through the heat treating process as well.